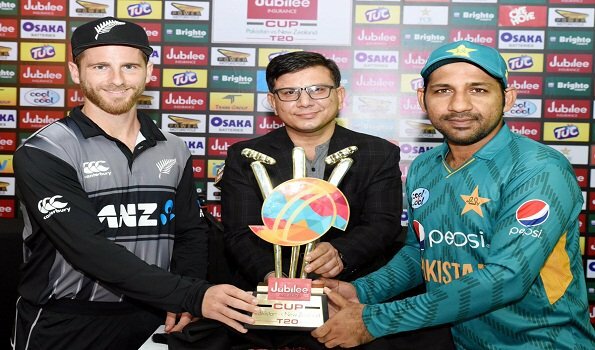 Abu Dhabi: After Pakistan won their 10th straight Twenty20 International series, captain Sarfraz Ahmed said he wants his side to "carry forward the winning momentum" in the upcoming assignments against New Zealand. Pakistan recently whitewashed Australia 3-0 at 'home' in the United Arab Emirates and denied the visitors the chance of replacing them at the top of the MRF Tyres ICC Men's T20I Team Rankings, an ICC report on Wednesday said. "We want to carry forward the winning momentum of the Australia series," said Sarfraz ahead of the three-match series against New Zealand, the first fixture of which is on Tuesday here. "It is an important series for us. The previous series against Australia is history now. New Zealand are a good team and they have been performing in T20 cricket. We will try to carry the momentum. The first match of is always of extreme importance. So, we will try to begin the series on a good note," Ahmed said.Sarfraz added that starting the series with a win will help set the tone against a well-balanced New Zealand side, saying: "They have a strong team with ideal batsmen for Twenty20 and a balanced bowling attack, so we need to set the tone from the first game by winning it." "Obviously, Pakistan are a strong side. That's something we've known for a long time," said Williamson. "I think last time we played them was at home in New Zealand, it was a tough series. Coming over here they're extremely strong in these conditions and their world ranking suggests that as well, and they've had a lot of success in recent times, so we know it's a tough challenge but one we're looking forward to. New Zealand will be playing an international game after a gap of almost seven months and their first T20I in nine months. "Yes, it an unusually long time between internationals," Williamson admitted. "But there is a lot of cricket being played in different competitions and also the guys have had some cricket.